It is not unusual when counseling from God’s Word that I learn of situations where women have lost their husbands through death. In most cases, these women have been provided for or are able to earn a living and with time, they go on to live their lives with some sort of normalcy. However, in some cases, the loss of their husband proves to be not just devastating in their personal loss, but financially they find themselves in a desperate situation and in need of help. One such example is found in the book of Ruth, where a widow who is in dire straits has her needs met by a man named Boaz. Looking at a character profile of Boaz in the Bible, we can learn many things about caring for the needs of others and how God makes provision for His children. The book of Ruth is the story of a woman named Ruth who became a widow by the death of her husband. The story begins in Chapter One during the time when the Lord appointed Judges to rule over His people. A woman named Naomi, along with her two sons, went to live in Moab, along with her husband Elimelech because of a famine in Judah. Elimelech later died and Naomi stayed in Moab with her sons. The sons married Moabite women, Orpah and Ruth, and they continued to live in Moab for about 10 years until both of the sons died. Naomi found herself living with her two daughters-in-law and they were unable to provide for themselves. So, she decided to return to Judah and told her daughters-in-law that they should return to the homes of their mothers. The daughters-in-law wanted to remain with Naomi, but she told them that she could not provide new husbands for them. Orpah left, but Ruth committed herself to staying with Naomi and caring for her so they both left to go live in Bethlehem. After moving to Bethlehem, they came in contact with a wealthy man who was a relative of Naomi’s late husband. The wealthy man was Boaz. One day, Ruth asked Naomi if she could go to the fields of Boaz to glean some ears of corn after the harvest to eat as was allowed in the Old Testament law (Leviticus 19:9-10; Deuteronomy 24:19-22). Naomi told her to go and Ruth left. At the same time, Boaz came to oversee the harvest when he spotted Ruth. Ruth asked him permission to glean from the field and he agreed. At the end of the day, Boaz told Ruth that she could continue to glean from his fields as needed and even take some of the water the men had drawn. He added that he had also given orders to the men not to touch her. When Ruth asked why he was doing this for her, he told her it was because she had left her homeland to take care of her mother-in-law, Naomi (Ruth 2). Ruth’s use of this term referred to a custom of Judah and later a provision in the law that allowed for a male relative of a widow or other destitute person to be her “kinsman redeemer” (Genesis 38; Leviticus 25:23-55; Numbers 27:1-11; Deuteronomy 25:5-12). A kinsman redeemer is described as follows (1): “The nearest living blood relation to a man had certain obligations and offices to discharge, under certain contingencies, in respect of which he received a special name; which is sometimes translated in the Old Testament ‘Redeemer,’…” In the case of Ruth, she was calling upon Boaz to be her kinsman redeemer. What is telling about Boaz is that he immediately was pleased with her request because she did not ask someone who was younger and richer. He recognized that she asked him because of his kindness to her. However, Boaz also knew that he was not her closest relative so he told her he would speak with that person that day to see if he would redeem her. He added that if that relative would not redeem her, he would be her kinsman redeemer. In the morning, he sent Ruth away with six measures of grain to provide for her and her mother-in-law. Later that day, Boaz approached the near kinsman of Ruth and told him that Naomi had some land to sell and asked if he would like to buy it (Ruth 4). The man responded that he would. However, Boaz added that if the man bought the land, he must also take in Ruth and provide for her. Upon hearing this, the man claimed that he could not do this because it would put a financial strain upon himself so he told Boaz to do it. Boaz then claimed before witnesses that had been gathered there that he would do so. 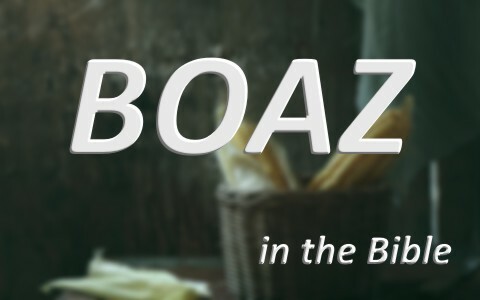 What can we learn from the character profile of Boaz? First, we see that Boaz recognized the plight of Ruth as being in need. Second, although Boaz was not rich, he allowed Ruth to share in his provision. Third, we see that Boaz knew that there was another family member that had the responsibility to provide for Ruth. Fourth, we see that Boaz approached the other family member and made known to him the need to redeem Ruth. Finally, when the other family member would not do so, Boaz stepped in without hesitation and redeemed Ruth. Boaz did take in Ruth and married her and they had a son. In redeeming Ruth, Boaz enabled Ruth to redeem Naomi better than seven sons (Ruth 4:13-21). Boaz and Ruth had a son who became the grandfather of David through whom later would come our Redeemer, Jesus Christ. The example of Boaz serves as a reminder how God had a plan to provide a kinsman for us through His Son, Jesus Christ. He provided for our needs, calls upon us to provide for each other, and purchased us with His blood at a great cost. Like Boaz, He also considered redeeming us to be a joy (Psalms 19:14; Psalms 78:35; Isaiah 54:5; Jeremiah 50:34; Hebrews 12:1-3; Revelation 5:6-10). Previous post: Who Does The Bible Call A Fool? Next post: Who Does The Bible Say Will End Up In Hell?